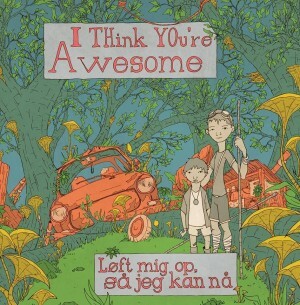 I hesitate to put the debut album Lift me up so I can reach by Danish band I Think You’re Awesome into any particular category. But it fits easily into the “I-loved-this-the-moment-I-first-heard-it” box. In just 36 minutes over 6 tracks and in a live performance, Jens Mikkel‘s band has created a unique and complex soundscape with tracks of great beauty and serenity sitting comfortably alongside compositions which are instantly arresting, memorable, witty and fun such as Be Kind to Your Neurosis. It is a mature work by a band which brings so many genres into play here – pop, indie, jazz, classical, roots. The instruments are interesting – when did you last hear a banjo? And it is the work of equals, everyone brings their strengths and bass player Jens Mikkel allows them the space to breathe and intermingle within his own affectionate compositions. There are many influences – to my ears there is sitar and the lilt of kora in the symphonic track called I Think You’re Awesome (where the wurlitzer provides a very distinctive sound remembered from the Beach Boys) . Yet it all sounds new and fresh and moves along so effortlessly and perfectly you can’t believe this is a live performance. The title of the album refers to the idea that you can take pride in your achievements even as you are helped by others (those giant’s shoulders) along the way. In an album of exquisite performances from everyone, special mention must be made of the sublime lyrical beauty of the cello of Maria Isabel Edlund in Schwartzwald. This is a haunting piece that could be classical but sounds cinematic and modern with the aid of some subtle electronics, dance-like rhythms and abrupt ending. The sound quality and mixing is beautiful throughout. 3 The Lost Moose which both feature Jens and Alex and are equally atmospheric.